What are some great home fragrances to switch to in the fall and winter? There’s nothing like the cozy feeling of the chillier months, which brings us indoors more often to seek some warm comfort. Now that the autumn and winter have us craving pumpkin-scented foods and cinnamon holiday snacks, it’s the perfect time to transform the scent of your home to match your mood. We recommend adding these three home fragrances to your sacred abode, which we’re already exhibiting on the fireplace mantel (plus a room spray that instantly takes you away to far-off places). C.O. 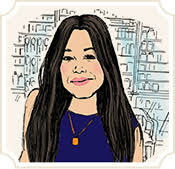 Bigelow Candle in “Smoke”: Summertime is for citrus and florals, fall and winter are for smoke! Whether you display it on your dining room table or in the powder room, this elegantly understated candle by ours truly fits into any theme or décor, evenly and steadily dispersing its top notes of Fresh Cardamom, Cold Winter Air and Clove Buds throughout. A custom blend of Old Cabin Leather, Crackling Firewood and Smooth Amber inspire a feeling of winter snugness, while Smoked Embers, White Musk, Warm Cedar and Silver Birch complete the scent. This candle was specially crafted by C.O. Bigelow using a proprietary blend of waxes with lead-free wicks to ensure even melting. Burns approximately 60 hours. C.O. Bigelow Candle in “Amber”: This candle looks just like the Smoke scented candle, but its aroma is quite different. Its luxurious fragrance oils emanate a rich, sophisticated scent with a sultry, masculine dash of Textured Leather, White Citrus and Tonka Bean. This candle is one of our CEO Ian Ginsberg’s all-time favorites! 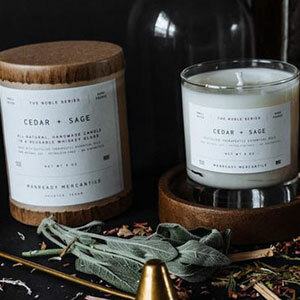 Manready Mercantile Candle in “Cedar & Sage”: Manready Mercantile’s debut product, this gorgeous candle nostalgically whisks you away to a warm campfire with its invigorating, yet tasteful and nuanced aroma from the natural essential oils of cedar and sage. In aromatherapy, cedar is known to enhance wisdom and focus, while sage is credited with helping to stimulate the mind. Diligently created by pouring clean-burning soy wax into batches of reusable whiskey glass, this candle burns for up to 40 hours. Carthusia Room Spray in “Note Oriente”: A signature fragrance for your safe haven, Carthusia’s room spray allows you to choose any area you wish to indulge in some R&R and imbue your own microworld with a sensual blend of wild rose and musk spiked with hints of cinnamon. This exotic and spicy scent lingers just enough to transport you to your most luxurious fantasy getaway, all while you cozy up in your own home. There’s nothing like the cozy feeling of the chillier months, which brings us indoors more often to seek some warm comfort. Our experts recommend some great home fragrances for the Fall and Winter.